Gaining an international perspective requires that students have some real international experience. 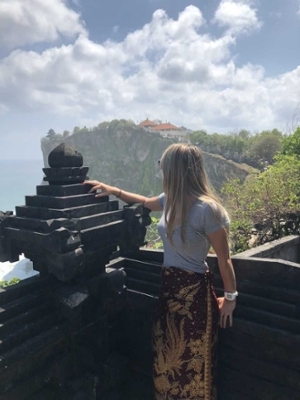 Although there are several way to achieve this international experience, UNCW's Office of International Programs offers a wide variety of exciting Study Abroad and Exchange opportunities. UNCW offers more than 500 programs in over 50 countries, including an array of study abroad programs available through ISA, UNCW’s most trusted affiliated education abroad provider. Find a wide selection of programs specifically recommended for the International Studies students organized by concentration. Contact ISA or the Office of International Programs to take the next step. If you are looking for a Summer 2017 Study Abroad opportunity: How about Morocco? Check it out! Studying in Copenhagen has been the most enriching experience I've had in all my traveling. Denmark is a progressive and well developed country and the people and culture were so different and interesting. I instantly fell in the love with their way of life. I even extended my stay over the summer and got an internship. I never thought that my 7 months there would open so many other doors and experiences for me and I wouldn't have wanted it any other way. It has helped me make connections and figure out exactly what I want to do in life. Bali, Indonesia is well known as a tourist destination, but who knew there were opportunities to study there? My experience in the Balinese Macaque Ethnoprimatology Field School was unforgettable. From the incredible food to the gorgeous views around every turn, Indonesia is rich in culture and the locals are eager to share it with you! Creating long-lasting friendships with those also participating in your study abroad program is easy to achieve when making such amazing memories together. Learning applicable skills in my field as well as navigating life in a foreign country has helped me grow both personally and professionally. This program was the perfect fit for me! My study abroad experience in South Africa during the summer of 2012 was by far the most remarkable month of my life. I have never been surrounded by such breathtaking landscapes and inspired by so many amazing people on a daily basis. I was exposed to a beautiful culture of friendly and knowledgeable people who went out of their way to open up about the difficult historical and modern-day problems many South Africans are still dealing with today. Studying abroad forced me out of my comfort zone, introduced me to lifelong friends, and showed me how important it is to see the world through the eyes of others. My time in South Africa enriched my life and I truly value the individual I am today because of it. International Studies emphasizes the importance of study abroad in our new era of globalization and I was lucky enough to travel to The Hashemite Kingdom of Jordan for my last semester of my undergrad. This was an awesome opportunity that helped me gain language and cultural skills that are sought after in today's international job market.